Another Finished Object: Cable Vest (#17) by Twinkle/Wenlan Chia from Vogue Knitting magazine, Holiday 2004 issue. I used 5 skeins (500 gr) of Harmony Ironstone Yarns. It's a bulky yarn but I still knit with 2 strands together and my gauge/tension was 9 sts / 4". I used 12 mm Pony circular needles and I cast on 14 sts instead of 12 sts. For the front collar I made one extra cable pattern repeat. Overall, I'm pretty pleased with how it turned out. It was a fast knitting, only 3 days. I love how this vest came out. It looks fantastic! Wow....That vest is so cool. I love it! How have you been? Great I hope. I love this vest. I think mostly because it has a very unique shape, looks like braids. The Harmony yarns, are very wearable, not itchy! Very nice share, Thank you! 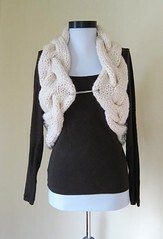 Does anyone still have this Wenlan Cable Vest pattern from Vogue still that they could post? Hi. I've been searching for this pattern with no avail. Where can I find it?